“non-family-friendly” rating) from Hagadorn Village where he strives to strike terror and fear into anyone crossing his path. Much to his dismay, he is anything but scary and everyone’s favorite little guy. When he’s not munching on dirty roots and sour milk, he’s running errands for a fairy godmother. 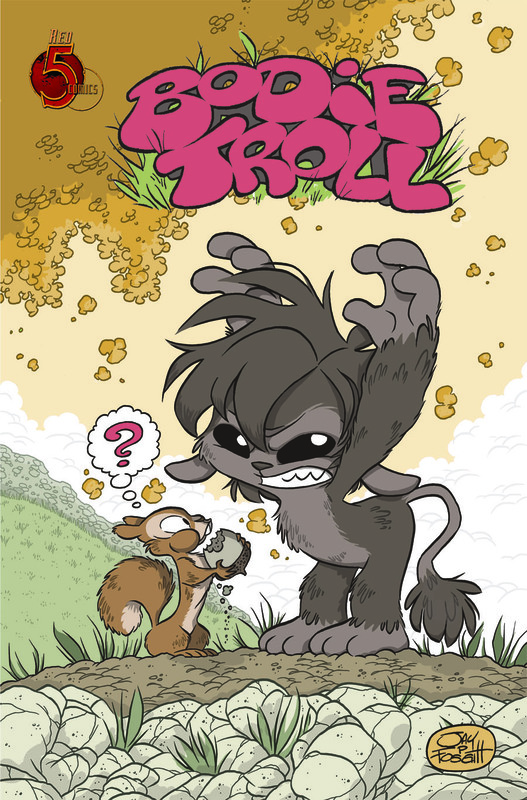 From the Jay P. Fosgitt, issue #1 of Bodie Troll is set to hit shelves this April. A 224-page softcover with French flaps, 6.88″ x 10.44″. We’ve gotten our hands on a review copy, so check back to see what the FP staff thinks of it! When an airborne virus consumes the planet, turning a tenth of the human population into flesh devouring monsters, life as everyone had known it was over. Family members turned on each other. People killed themselves in masses, and the world fell to the sick and the dead. Watch the infection spread as the falls apart following the dead in …LIVES OF THE DEAD. The Plagued is a new series brought to you by Forbidden Panel. Created, written, and drawn by Daniel Whitfield with cover art by Camille Alaras, this series follows the Zombie Apocalypse from the view point of the Zombies themselves. Follow the infection as it is transferred from person to person, 1 bite at a time. The Plagued will debut at Wondercon on March 16-18th. Come visit the creator at the Forbidden Panel booth and pick up your copy. From the team that brought you BETRAYAL OF THE PLANET OF THE APES comes an all new Apes saga! Gabriel Hardman (HULK, AGENTS OF ATLAS) and Corinna Bechko (HEATHENTOWN, FEAR ITSELF: THE HOME FRONT) team up with red hot artist Marc Laming (AMERICAN CENTURY, THE RINSE) to take the fan-favorite franchise to all new heights in this can’t-miss mini-series. With ape society gripped in uncertainty, Doctor Zaius must find a way to unite the warring factions before they rip the city apart. It’s up to one lowly chimp to seek out the famed, disgraced General Aleron deep in the heart of the Forbidden Zone, with a secret that might help — or destroy! The secrets of the Cenobite War revealed! The first year of Clive Barker’s long-awaited return to Hellraiser has been full of jaw-dropping events and new characters, forever changing the landscape of the classic horror universe. Now, only in this annual, learn the shocking secrets behind those seismic shocks to the Cenobites, the Cottons, and the hierarchy of Hell! This all new story will give clues to future storylines, so no Hellraiser fan can miss it! BRAND-NEW ARC! GREAT JUMPING-ON POINT FOR NEW READERS! The source of the imbalance of Law and Chaos that’s been assaulting the Multiverse is revealed, and it will leave Moorcock fans reeling! Finally, all incarnations of the Eternal Champion will have to join together to fight against forces bigger than Law and Chaos, for the very survival of existence itself! Legendary fantasy author Michael Moorcock and New York Times bestseller Chris Roberson (iZOMBIE, STAN LEE’S STARBORN) bring Elric, Hawkmoon and Corum back to comics in this critically acclaimed series! Another bi-monthly dose of classic Hellraiser high strangeness comes your way! We have the next two epic installments of “The Devil’s Brigade,” with Erik Saltzgaber and Jackson Guice delivering “No Loss to the Community,” followed by “Black & White,” written by Larry Wachowski, of The Matrix fame, with art by Denys Cowan. With Chapter 11 of “The Devil’s Brigade,” the epic tale of Leviathan’s most fearsome soldiers, Nicholas Vince and Sam Kieth team up to bring you “Believe the Sinners.” Next, in “Songs of Metal and Flesh” by Peter Akins and Dave Dorman, will even the blind be spared the hooks of the Cenobites? From the darkest depths of the underworld comes another thrilling installment of HELLRAISER MASTERPIECES! Since her apparent betrayal, Alana Patel has been on Max Damage’s long list of enemies. But when Alana is in danger and Max is called upon to save her, can he find the heart of a true superhero within himself and finally forgive the sins of the one person who forgave his? An unforgettable arc in the companion to Mark Waid’s Eisner-nominated superhero series, IRREDEEMABLE! THE FALLOUT FROM THE REVELATION OF THE PLUTONIAN’S ORIGIN CONTINUES! As the Plutonian struggles with his past, the world is on the brink of nuclear apocalypse. Is there anything on earth that can save the human race now? Or will that savior come from…somewhere else? A gripping installment of Mark Waid’s Eisner and Harvey Award-nominated superhero saga. When the Lawgiver was assassinated by a human freedom fighter, the world plunged into chaos. Sullivan, now free from Alaya’s clutches, takes humanity’s fight for freedom to the next level, in a devastating gambit for ape and human alike! Writer Daryl Gregory and artist Carlos Magno continue their critically acclaimed run and end this arc on a cliffhanger that you have to read to believe! From the one and only Grant Morrison — the conclusion of “The Golden Game!” Psychedelic secret agents John Steed and Emma Peel search for Tara King as she leads them to a secret society obsessed with deadly games. Will our heroes survive The Leopard People? Featuring artwork by Ian Gibson, best known for his work with Alan Moore on “The Ballad of Halo Jones.” The original British TV series The Avengers helped define the “Spy-Fi” genre and now Grant Morrison is serving up a science fiction/spy fiction mash-up with two of TV’s most iconic heroes! Celebrated creator Camilla d’Errico delivers a stunning visual journey exploring emotion, self-discovery/innocence and what it means to be human. TANPOPO is superhumanly intelligent and inhumanly emotionless. Attached to a mysterious machine and ruled by her vast knowledge, one day her heart rises up to struggle against her ruling mind. Torn and confused, she now seeks humanity, longing to feel what other humans feel. Each chapter of TANPOPO is inspired by a classic piece of literature or poetry, woven into its own epic story, and contained in this beautiful hardcover edition. THE FIGHT READERS HAVE BEEN WAITING FOR! Max Damage, a terrifying supervillain turned superhero, is alone, thanks to the strain of the Plutonian’s return to earth. He’s excommunicated all of his allies, and he doesn’t even know about the new sidekick he inspired, a former supervillian who calls herself Hatecrime. All Max knows is that the Plutonian has finally come for him. And it’s a fight he’s ready for… Don’t miss this pivotal volume of Mark Waid’s superhero redemption series! New York City is down but not out – the zombie apocalypse has destroyed much of the city, but hard-boiled humanity hangs on. But with the survivors divided into warring factions, and the undead hiding behind every corner, only one man can walk the streets alone: Nick Ewing. His murdered wife and child, from the grave, give him the strength to continue his vendetta against the king of Yankee Stadium. The complete collected hit series from Coheed and Cambria frontman Claudio Sanchez, Chondra Echert, hot new talent Aaron Kuder, and cover artist Nathan Fox. IT’S TOTALLY MATHEMATICAL! Join Finn, Jake, and all of their friends in this second issue of the ongoing comic book series showcasing all-new adventures through the magical Land of Ooo. The boys have embarked on another crazy-cool adventure, and this one will be their longest, most exciting yet! The top-rated Cartoon Network show now has its own comic book! The Adventure is just beginning, so don’t miss out on this exploding phenomenon—this is an issue that will go FAST! The adventure continues as Roger Langridge — the Harvey Award winner behind THE MUPPET SHOW and THOR: THE MIGHTY AVENGER — brings you the next chapter of his critically acclaimed side-splitting series! Having thwarted the dastardly crocodile Big Norman, the crew of the Snarkhunter is faced with their biggest threat yet — a pirate attack by some very familiar Lewis Carroll characters! Don’t be late! Don’t be late! Join Princess Scarlett, baby Rusty, the Walrus and the Carpenter for this very important date! From the newspaper strips to the animated specials, Charlie Brown, Snoopy, and the Peanuts gang have held a special place in America’s heart since first appearing in 1950. Let that young reader in your household discover these beloved characters like they were brand new! Peppermint Patty and Marcy join the series in “School Daze,” and Charlie Brown dons his Manager’s cap for another year of Spring Training. Includes classic Sunday strips from Charles Schulz and a special Linus 1st appearance variant cover! Before the spring thaw, KaBOOM! is serving up a mammoth heap of ICE AGE! Join the bumbling Sid the Sloth, the practical Manny the Mammoth, the cunning Diego the Saber-tooth Tiger, and the hilarious saber-toothed squirrel Scrat in an exciting all-new frozen adventure! Featuring wacky, beloved characters from the hit film series! In his first full graphic novel since his Eisner Award-winning performance on SATCHEL PAIGE: STRIKING OUT JIM CROW, Rich Tommaso delivers another gem with PETE AND MIRIAM. From the trouble caused by youthful impulses to exploring the seedier side of what life has to offer outside their suburban confines, Peter and Miriam forge their friendship through the odyssey of coming of age in America. This hot item at Angouleme is now available in the U.S. for the first time! Best music for a trailer I’ve heard in awhile.